This peak is #1 on the Height List for New Mexico . 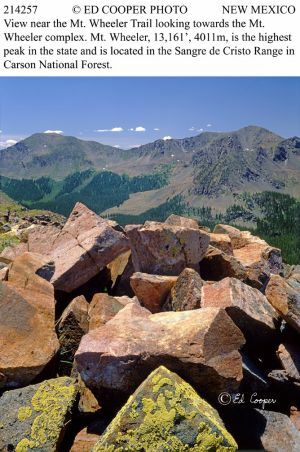 This peak is #11 in Prominence List for New Mexico .Wheeler Peak, the highest peak in New Mexico, is located near the south end of the Sangre de Cristo Mountains. It's an easy peak to climb. A trail traverses the summit. Note that there is another Wheeler Peak that is the second highest mountain in Nevada.